One of the best parts about being involved with Dorkbot is that it has kicked me into making some new sculptures. The Winter Lights show at Vermillion Gallery opened last Thursday and our piece was in it. Bob Gallup and I collaborated again with great results I built the physical platform and Bob handled the software (with his usual skill and aplomb). 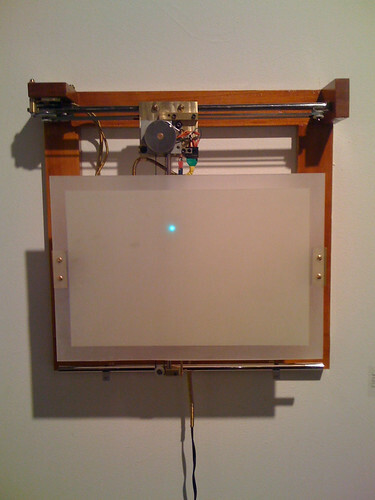 The piece uses a UV LED to draw vector patterns on a phosphorescent screen. 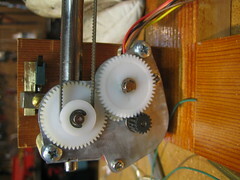 It is controlled by an Arduino, with an Adafruit motor controller board to run the motors. I am really happy with the way it turned out. The flotsam piece we worked on last summer was a bit of a compromise for me. I had not yet gotten the garage set up, and many of my tools and materials were still packed away. This time I had most everything out and ready to use. I treated this as an exercise in patience and intention. Every step was carefully considered, and if I screwed something up (which was often) I did it over again instead of hacking it together. I wanted to try and build something that looked as if it would have been right at home in an early laboratory, so that meant it had to look handmade, but also polished and "engineered". Every decision was made based upon functionality, and I tried very hard to avoid any kind of ornament or decoration. Although I would really have appreciated the milling machine I left in Philadelphia, I was pleasantly surprised with how much I could do just using my drill press, band saw, and hand tools. 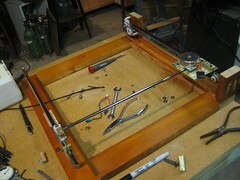 I started by building a frame from scraps of reclaimed Douglas fir from a local architectural salvage place. I have completely fallen in love with stuff. It is everywhere out here, and I really enjoy working with it. The next step was to start laying out bit and pieces of ink jet and scanner hardware. I was looking for a good pair of stepper motors that I could use as X and Y axis drivers. I have lots of these so it was not too hard to find two that would work together, I also dug out a pile of polished steel rods (also from printers and scanners) and some linear bearings that originally held the print heads of an ink jet. The x-axis is almost a complete steal from an old scanner with the ink jet linear slide being the only addition. 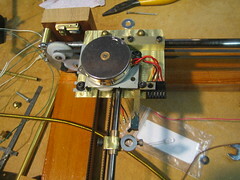 I made up a brass plate to ride on the x-axis and hold the y-axis motor and rod assembly. The y-axis is all custom made with bits and pieces from aho knows how many other machines. It was fun to machine up the various fittings I needed for keeping everything in place (even though I ended making many of them at least twice). Brass was my material of choice as it is easy to work, and it looks great with the warm color of the Fir. I was initially very concerned with how to manage the wires. 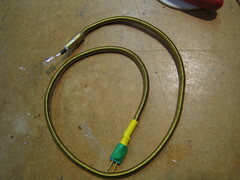 I considered lacing them, but in the end I made long brass springs out of fine wire and slid the wires through them. They look amazing (if I do say so).